A man under a blue umbrella, walking in the not-quite-sunshine of early morning. A woman, blonde, crossing the road with a cane. Another woman, dark haired, staring at the device in her hand while behind her walks, skips, occasionally hops, a boy too blessedly young for a device, picking what appear to be invisible plums from the air. An abandoned barbeque, hoping for a thief with gourmand tendencies. 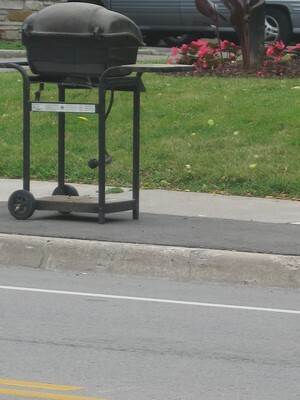 Looks like the barbecue is trying to make a break for it, thumbing a ride by the side of the road, hoping to be picked up a family on their way to cottage country (or to be adopted by the imaginary plum boy? ).